The magnificent new Phoenix Digital Draw-stop Organ in Pine matches the Chapel interior. It has American Black Walnut stop jambs, and an Oak and Beech pedalboard. 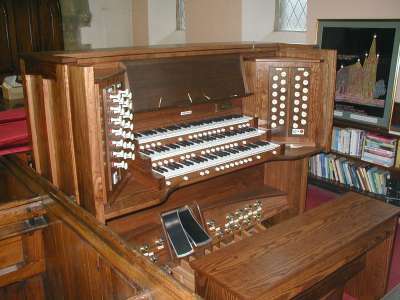 The organ has 3 manuals, 48 speaking stops plus Tremulants, couplers and a full range of stop control accessories. "We commissioned a three manual custom built draw-stop instrument from Phoenix Organs UK made from pine and stained to match the interior at Nazareth Unitarian Chapel Padiham. We took delivery some nine months ago. Over a period of a few months, the digital sound samples were adjusted and finished on-site by David Bostock (the Principal of Phoenix Organs UK) so that the instrument sound as we wished in the Chapel. We have had three of the first series of 5 concerts organised for the instrument and the general consensus of the audience has been most favourable. I cannot speak too highly of the painstaking attention of David Bostock, not a merely before its production, but during the installation and especially afterwards. Nothing has been too much trouble. Anyone wishing to visit the Church to see the instrument for themselves is most welcome, you only need to contact David to arrange a visit. I unreservedly commend the company to anyone considering a digital instrument of high quality at a most competitive price!"